Bernie Vince is up to a careerhigh 10 tackles. Jack Viney is up to a careerhigh 12 tackles. Lachie Neale has recorded gamehighs for contested possessions (15), first possessions (13) and clearances (10) to go with his 34 disposals and two goals. Daniel Cross is up to a gamehigh nine intercept possessions. Two of them have launched goals for the Demons. The Demons lead the centre bounce clearance count 118 but have been outscored by seven points from this source. Aaron Sandilands is up to 14 hitoutsto-advantage for the game with three of them launching scores for the Dockers. Sandilands has recorded a game-high five score launches, three more than any other player. From the 13th minute of the third quarter the Dockers won the clearance count 72, generated 12 inside 50s to three and booted two goals to none. That Docker goal was launched from a kickin. It was the first score for the game launched from this source. Lachie Neale is up to four clearances for the quarter and seven for the game. No other Docker has won more than one this quarter. Nick Suban has won a teamhigh five intercept possessions, including three this quarter, with his fifth launching the Dockers' third goal from defensive half turnovers. The Demons have recorded 11 of the last 14 inside 50s and they have generated six scores to two during this run. The Demons have won 11 of the last 14 clearances and they have booted two goals to one from stoppages during this run. Oscar McDonald's 12th possession was his first intercept possession and it launched the Demon's fourth goal from turnovers. The Dockers have won the first two clearances of the quarter with the second launching their seventh goal of the game from stoppages. Jack Viney has been a shining light for the Demons. Viney leads his team for contested possessions, first possessions and clearances. The Demons were more than competitive from the 15 minute mark of the second quarter. They won two more clearances, generated four more inside 50s and booted four goals to one. Despite the Dockers leading the clearance count 2416, Jack Viney has won an equal game-high six clearances. Demons InterchangeJake Spencer and is possibly out for the game. The Demons have won the last four clearances of the game with the fourth, won by Jeff Garlett, launching their first goal from stoppages. Daniel Cross has won a gamehigh five intercept possessions with his fifth launching his team's third goal from turnovers. The Demons have created eight forward half turnovers and scored just one goal from them. The Dockers have generated four scores from six forward half turnovers. That Jeff Garlett mark was the Demons' first inside 50 from 14 entries. The Dockers have grabbed six marks inside 50 from 21 entries. The Dockers have recorded a kicking efficiency of 92 per cent this quarter. They have had 28 more effective kicks than the Demons. The Dockers have now recorded the first six inside 50s of the quarter and generated five scores from them. David Mundy has recorded a quarterhigh seven disposals and has been involved in all five of his team's scores. The Dockers have been efficient to start the second quarter. The lead the effective kick count 101 and the inside 50 count 4-0 on their way to booting three goals. That was the Dockers first goal launched from a chain originating in their defensive half. Demons InterchangeNathan Jones and is possibly out for the game. The Dockers have now booted four goals from stoppages. Matthew Pavlich was one of the Dockers better players. He recorded nine disposals at 89 per cent efficiency, won a quarterhigh six contested possessions and was involved in a quarter-high four scores. The Dockers dominated that quarter. They won the ball in the contest, winning 18 more contested possessions and seven more clearances, and were able to retain possession, recording 22 more effective kicks. Garrick Ibbotson has won two intercept possessions with both launching goals for the Dockers. The Dockers have now won the last seven clearances to lead the clearance count 125. They have generated three scores to one from stoppages. David Mundy has won a gamehigh three clearances with his last launching the Dockers third goal from stoppages. The Dockers have won the last four clearances and recorded the last four inside 50s. All four of their scores have come from chains originating in their forward half. The Dockers have scored two goals from forward 50 stoppages. That Danyle Pearce clearance ended a run of four consecutive clearances for the Demons. The Dockers lead the clearance count 65 and both teams have generated one score from stoppages. That goal to Matthew Pavlich was launched from the Dockers first turnover created in their forward half. The Demons have created four forward half turnovers and failed to score from them. 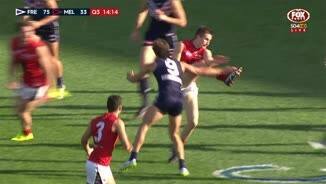 Jack Viney has recorded a teamhigh four disposals and won the only two clearances for the Demons. The Dockers have won the last four clearances to lead the clearance count 41. Stephen Hill won the Dockers fourth clearance which launched the first goal of the game. The Demons have recorded the first three inside 50s of the game but failed to capitalise on the scoreboard. To the end of round 21, Tom McDonald won 130 intercept possessions, ranked No.1 at the club and 10th in the competition. From round 17 to round 21, the Demons averaged 118 effective kicks per game, the fewest of any side. In the six weeks from round 16, Stephen Hill gained 602 metres per game, ranked second across the competition. From round 17 to round 21, the Dockers conceded 43 inside 50s per game to their opposition, ranked No.1 in that time. Welcome to Domain Stadium for the Fremantle v Melbourne Round 22 clash. Don't forget to enter your tips for this match, you have until the bounce to make your selection. 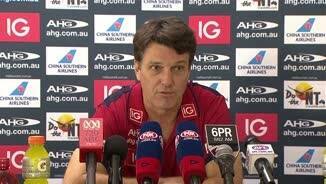 Tippers choice is currently Dockers 98.1% and Demons 1.9%. FREMANTLE has claimed the minor premiership for the first time in the club's history with a professional 54-point win over a lacklustre Melbourne at Domain Stadium. The Dockers' 17th win of the home and away season, a new club record, was built on the back of a five-goal to none opening term as they notched 100 points for the first time since round eight. 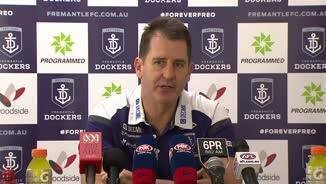 Fremantle booted the first 10 goals of the match to cruise to the 17.6 (108) to 8.6 (54) result, which will allow Ross Lyon to rest players next week against Port Adelaide ahead of a home qualifying final. "If you'd have said we were going to secure top spot with one round to go, we would take that every day of the week," Lyon said post-match. "It's the first time in the club's history, so we tick that box. But we understand it's just the starting point for the real season. It's really about getting a good grid position to attack the real season." The Dockers simply did what they needed to against a Melbourne side that failed to play with the anger and passion that coach Paul Roos had asked for during the week. 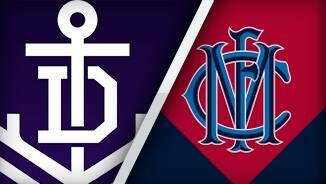 The Demons were held to just one point in the opening term, their lowest-ever first quarter score against Fremantle, although they did manage to kick more than six goals for the first time in six outings against the Dockers. "We slaughtered the ball early, which didn't help us," Roos said post-match. "We did have opportunities to score – inside 50s, we just didn't create anything from them. "I think we lose confidence when we don't score, which is understandable." The result was compounded by a left ankle injury to skipper Nathan Jones. He spent the second half of his 200th game in a moon-boot and on crutches after he was subbed out early in the second term. "He just rolled his ankle and possibly could have come back on," Roos said. "But it was one of those things, if you jab it you probably do more damage to it. By not doing it, it gives himself a chance of playing next week. That was the decision we made." Jake Spencer also suffered concussion after copping a knock to the head in a marking contest. The Dockers also suffered an injury concern with defender Cam Sutcliffe dislocating his right shoulder in the last quarter. He had it popped back in shortly after coming off the ground. 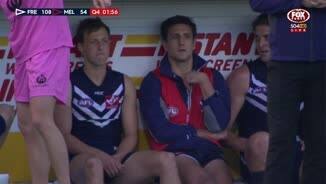 Dockers skipper Matthew Pavlich was subbed halfway through the third term, after bagging three goals, as Ross Lyon began to manage his key players. Michael Walters was not risked at all, withdrawn before the match due to calf soreness. The Dockers mauled the Demons all over the ground. Aaron Sandilands was dominant in the ruck with 43 hit-outs to feed a rampaging midfield. Lachie Neale (34 disposals and two goals) and David Mundy (35 disposals) had 19 clearances between them. They also had 11 different goalkickers with Pavlich and Danyle Pearce leading the way with three goals apiece. The Dockers even used defender Garrick Ibbotson up forward for most of the day. He kicked the opening goal of the match, his first goal since round nine, 2013. The Demons had 40 inside 50s but could not hit any targets. They took just four marks inside 50 for the day and it was the third week in a row they failed to register nine goals. Jack Viney fought hard with 30 disposals and six clearances, Daniel Cross collected 39 touches playing mostly in the defensive half, while Jesse Hogan and Jeff Garlett kicked two goals each.